Hunky Dory is a super-soft and luxurious shawl in 100% Pashmina Cashmere. 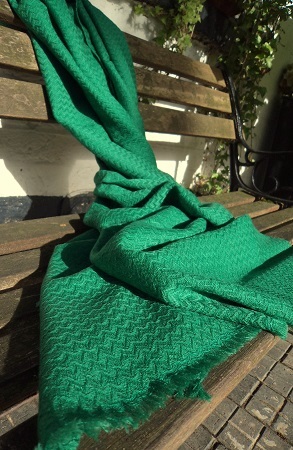 The horizontal zig zag weave gives texture and breaks up the block effect of the beautiful bold bright emerald colour. This is also a beautiful shawl or a large scarf that is suitable for women as well as men. It is a generous 70 x 200cms. SALE PRICE £95.00 (Usually £175.00) One remaining!